Former Newcastle United striker Andy Cole says Manchester United were the only club who could tempt him away from St James's Park. Cole moved to Tyneside in January 1993 from Bristol City and within his first six months, the club were promoted to the top-flight. He remained at Newcastle for two years, netting a magnificent 68 goals in just 84 appearances - 41 of which came in United's debut Premier League season where they finished 3rd. Even Cole himself admitted his 'dream' move to Old Trafford came as a shock as he was happy playing under Kevin Keegan. And speaking as a guest on Sky Sports' Monday Night Football after United's 2-0 at Arsenal, Cole opened up on his departure in 1995. He said: "It was a strange one as I played for Newcastle on the Sunday in the cup against Blackburn and Kevin (Keegan) didn’t mention anything. 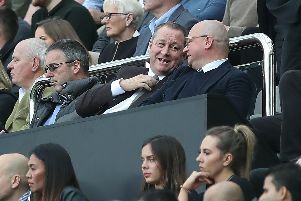 "I couldn’t leave Newcastle to go anywhere else, I always wanted to go Man United but I never thought it would happen. "I’d just signed a new contract and in those days, the money I went for was massive money. "I never thought it’d materialise but when it did, I was shocked but I was delighted at the opportunity." His move to the Red Devils brought much anger from Newcastle supporters, despite the £7million being a huge deal for the club. One famous incident seen fans confront Keegan at St James's Park, who explained his decision to sell the club's star striker. "Some of them (Newcastle fans) were disappointed in the way I left but I always try to explain, it was totally out of my hands," Cole added. "The manager makes a decision to sell, well you think: ‘He doesn’t want me anymore’ so naturally you move on. "Me going there and doing as well as I did, I know now how much they appreciate me. "I got inducted into the Hall of Fame at the back end of last season and that was a special thing. "To know: ‘Yeah, we do love you here. Fair enough you left to go to Manchester United but what you did for the football club is fantastic’."